49. The Need for and Meaning of Social Ecological Economics. Institute for Multilevel Governance and Development, Department of Socioeconomics, WU Vienna University of Economics and Business, 2017 (Clive L. Spash) 30pp. Published as: Spash, C.L. (2017). Social Ecological Economics. In Spash, C.L. (ed.). Routledge Handbook of Ecological Economics: Nature and Society (pp. 3-16). Abingdon: Routledge. 48. Environmental Values in Conservation: Ethics, Economics and Pragmatism. Institute for Multilevel Governance and Development, Department of Socioeconomics, WU Vienna University of Economics and Business, 2017 (Clive L. Spash) 26pp. 47. Voluntary Individual Carbon Trading. Institute for Multilevel Governance and Development, Department of Socioeconomics, WU Vienna University of Economics and Business, 2016 (Clive L. Spash and Hendrik Theine) 45pp. 46. The Economics and Ethics of Human Induced Climate Change. Institute for Multilevel Governance and Development, Department of Socioeconomics, WU Vienna University of Economics and Business, 2016 (Clive L. Spash and Clemens Gattringer) 34pp. 45. The Paris Agreement to Ignore Reality. Institute for Multilevel Governance and Development, Department of Socioeconomics, WU Vienna University of Economics and Business, 2016 (Clive L. Spash) 10pp. Published as: Clive L. Spash (2016) This changes nothing: The Paris Agreement to ignore reality (PDF) Globalizations 13 no.6: 928-933. 44. Bulldozing Biodiversity: The Economics of Optimal Extinction Institute for Multilevel Governance and Development, Department of Socioeconomics, WU Vienna University of Economics and Business, 2015 (Clive L. Spash) 35pp. Published as: Clive L. Spash (2015) Bulldozing biodiversity: The economics of offsets and trading-in Nature (PDF) Biological Conservation 192 December: 541-551. 43. Better Growth, Helping the Paris COP-out? Fallacies and Omissions of the New Climate Economy Report. (External link) Institute for Environment and Regional Development, Department of Socioeconomics, WU Vienna University of Economics and Business, 2014 (Clive L. Spash) 39pp. 42. The Politics of Researching Carbon Trading in Australia. (External link) Institute for Environment and Regional Development, Department of Socioeconomics, WU Vienna University of Economics and Business, 2014 (Clive L. Spash) 32pp. 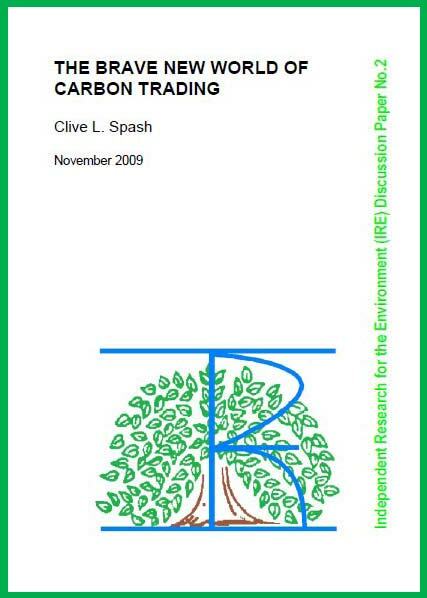 Published as: Clive L. Spash (2014) The Politics of Researching Carbon Trading in Australia. In Benjamin Stephan and Richard Lane (eds.) The Politics of Carbon Markets. Abingdon: Routledge, pp.191-211. 41. The Illusion of Consumer Sovereignty in Economic and Neoliberal Thought. (External link) Institute for Environment and Regional Development, Department of Socioeconomics, WU Vienna University of Economics and Business, 2014 (Wolfgang Fellner and Clive L. Spash) 39pp. Published as: Wolfgang Fellner and Clive L. Spash (2015) The Role of Consumer Sovereignty in Sustaining the Market Economy. In Lucia Reisch and John Thøgersen Handbook of Research on Sustainable Consumption. Cheltenham: Edward Elgar, pp.394-409. 40. The Ecological Economics of Boulding’s Spaceship Earth. (External link) Institute for Environment and Regional Development, Department of Socioeconomics, WU Vienna University of Economics and Business, 2013. Published as: Clive L. Spash (2013) The Economics of Boulding’s Spaceship Earth. In Wilfred A. Dolfsma and Stefan Kesting (eds.) Interdisciplinary Economics: Kenneth E. Boulding’s Engagement in the Sciences. Abingdon: Routledge, pp.348-363. 39. The Shallow or the Deep Ecological Economics Movement? (External link) Institute for Environment and Regional Development, Department of Socioeconomics, WU Vienna University of Economics and Business, 2013. Published as: Clive L. Spash (2013) The Shallow or the Deep Ecological Economics Movement? Ecological Economics 93 September: 351-362. 38. Re-establishing an Ecological Discourse in the Debate over the Value of Ecosystems and Biodiversity. (External link) (Clive L. Spash and Iulie Aslaksen). Institute for Environment and Regional Development, Department of Socioeconomics, WU Vienna University of Economics and Business, 2012. Published as: Clive L. Spash and Iulie Aslaksen (2015) Re-establishing an ecological discourse in the debate over how to value ecosystems and biodiversity. Journal of Environmental Management 159 August: 245-253. 37. Ecological Economics and Philosophy of Science: Ontology, Epistemology, Methodology and Ideology. (External link) Institute for Environment and Regional Development, Department of Socioeconomics, WU Vienna University of Economics and Business, 2012. 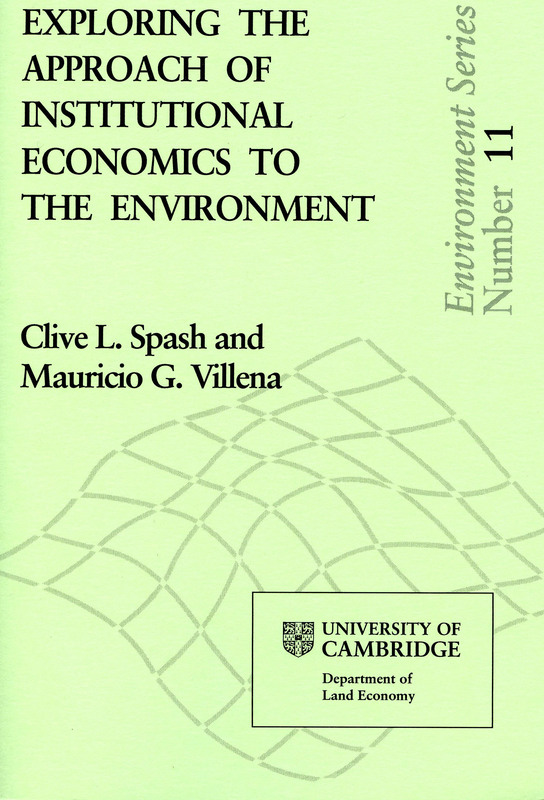 Published as: Clive L. Spash (2012) New foundations for ecological economics (External link) Ecological Economics 77 May: 36-47. 36. Australia’s Carbon Tax a Sheep in Wolf’s Clothing? (External link) Munich Personal RePEc Archive (MPRA) paper. 2011 (Clive L. Spash and Alex Yu Hong Lo) 35pp. Published as: Clive L. Spash and Alex Y. Lo (2012) Australia’s Carbon Tax: A Sheep in Wolf’s Clothing? (PDF) Economic and Labour Relations Review February 23 no.1: 67-86. 35. Articulation of Plural Values in Deliberative Monetary Valuation: Beyond Preference Economisation and Moralisation (External link) Munich Personal RePEc Archive (MPRA) paper 30002. 2011 (Alex Y. Lo and Clive L. Spash) 53pp. Published as: Alex Y. Lo and Clive L. Spash (2013)Deliberative monetary valuation: In search of a democratic and value plural approach to environmental policy (External link) Journal of Economic Surveys 27 no.4: 768-789. 34. Ecological, Heterodox and Neoclassical Economics: Investigating the Differences. (External link) Munich Personal RePEc Archive (MPRA) paper 26292. 2010 (Clive L. Spash and Anthony M. Ryan) 42pp. Published as: Clive L. Spash and Anthony M. Ryan (2012) Economic schools of thought on the environment: Investigating unity and division. Cambridge Journal of Economics 36 no.5: 1091-1121. 33. Measuring Beliefs Supportive of Environmental Action and Inaction: A Reinterpretation of the Awareness of Consequences Scale. (External link) Munich Personal RePEc Archive (MPRA) paper 23900. 2010 (Anthony M. Ryan and Clive L. Spash) 40pp. Published as: Anthony M. Ryan and Clive L. Spash (2012) The awareness of consequences scale: An exploration, empirical analysis and reinterpretation. Journal of Applied Social Psychology 42 no.10: 2505-2540. 32. Testing Kahneman’s Attitudinal Hypothesis. (External link) Munich Personal RePEc Archive (MPRA) paper 22468. 2010 (Anthony M. Ryan and Clive L. Spash) 24pp. 31. The Brave New World of Carbon Trading. (External link) Munich Personal RePEc Archive (MPRA) paper 19114. 2009 (Clive L. Spash) 47pp. Published as: Clive L. Spash (2010) The Brave New World of Carbon Trading (PDF) New Political Economy 15 no.2:169-195. 30. Social Ecological Economics. (External link) Paper No.2009-8 Socio-Economics and Environment in Discussion (SEED) Working Papers ISSN1834-5638. Commonwealth Scientific and Industrial Research Organisation (CSIRO), Canberra, Australia, 2009 (Clive L. Spash). Published as: Clive L. Spash (2011) Social Ecological Economics: Understanding the past to see the future. (External link) American Journal of Economics and Sociology. 70 no.2: 340-375. 29. Household Water Collection in Canberra. (External link) Paper No.2009-6 Socio-Economics and Environment in Discussion (SEED) Working Papers ISSN1834-5638. Commonwealth Scientific and Industrial Research Organisation (CSIRO), Canberra, Australia, 2009 (Anthony Ryan, Clive L. Spash and Thomas G. Measham). 28. Growth, the Environment and Keynes: Reflections on Two Heterodox Schools of Thought. (External link) Paper No.2009-1 Socio-Economics and Environment in Discussion (SEED) Working Papers ISSN1834-5638. Commonwealth Scientific and Industrial Research Organisation (CSIRO), Canberra, Australia, 2009 (Clive L. Spash and Heinz Schandl). Published as: Clive L. Spash and Heinz Schandl (2010) Challenges for Post-Keynesian Growth Theory: Utopia meets Environmental and Social Reality. In Post Keynesian and Ecological Economics: Confronting Environmental Issues. Edited by Ric Holt, Clive L. Spash and Steve Pressman. ISBN Cheltenham: Edward Elgar, pp.47-76. 27. Sustainable Consumption and Mass Communication: A German Experiment. (External link) Paper No.2008-12 Socio-Economics and Environment in Discussion (SEED) Working Papers ISSN1834-5638. 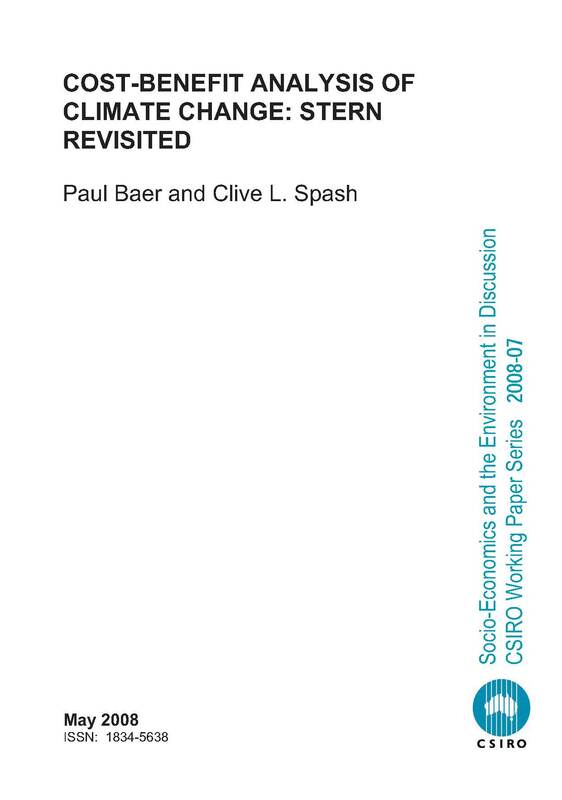 Commonwealth Scientific and Industrial Research Organisation (CSIRO), Canberra, Australia, 2008 (Lucia Reisch, Clive L. Spash and Sabine Bietz) 34pp. Published as: Lucia Reisch, Clive L. Spash and Sabine Bietz (2010) The Socio-Psychology of Achieving Sustainable Consumption: An Example Using Mass Communication. In Post Keynesian and Ecological Economics: Confronting Environmental Issues. Edited by Ric Holt, Clive L. Spash and Steve Pressman. ISBN Cheltenham: Edward Elgar, pp.178-199. 26. Measuring “Awareness of Environmental Consequences”: Two Scales and Two Interpretations. (External link) Paper No.2008-10 Socio-Economics and Environment in Discussion (SEED) Working Papers ISSN1834-5638. Commonwealth Scientific and Industrial Research Organisation (CSIRO), Canberra, Australia, 2008 (Anthony Ryan and Clive L. Spash). Published as: Anthony Ryan and Clive L. Spash (forthcoming) The awareness of consequences scale: An exploration, empirical analysis and reinterpretation. Journal of Applied Social Psychology. 25. Cost-Benefit Analysis of Climate Change: Stern Revisited. (External link) Paper No.2008-7 Socio-Economics and Environment in Discussion (SEED) Working Papers ISSN1834-5638. Commonwealth Scientific and Industrial Research Organisation (CSIRO), Canberra, Australia, 2008 (Paul Baer and Clive L. Spash). 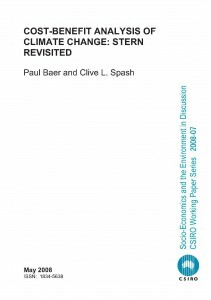 Published as: Paul Baer and Clive L. Spash (2009) Is Climate Change Cost-Benefit Analysis Defensible: A Critique of the Stern Review. In Science for Policy Edited by Ângela Guimarães Pereira and Silvio Funtowicz . New Delhi: Oxford University Press pp.167-192. 24. The Contingent Valuation Method: Retrospect and Prospect. (External link) Paper No.2008-4 Socio-Economics and Environment in Discussion (SEED) Working Papers ISSN1834-5638. Commonwealth Scientific and Industrial Research Organisation (CSIRO), Canberra, Australia, 2008. 23. Ecosystems Services Valuation. (External link) Paper No.2008-3 Socio-Economics and Environment in Discussion (SEED) Working Papers ISSN1834-5638. Commonwealth Scientific and Industrial Research Organisation (CSIRO), Canberra, Australia, 2008. Published as: Clive L. Spash (2008) How much is that ecosystem in the window? The one with the bio-diverse trail. (PDF) Environmental Values (2008) 17 no.2: 259-284. 22. Deliberative Monetary Valuation in Practice. (External link) Paper No.2007-4 Socio-Economics and Environment in Discussion (SEED) Working Papers ISSN1834-5638. Commonwealth Scientific and Industrial Research Organisation (CSIRO), Canberra, Australia, 2007. Published as: Clive L. Spash (2008) Deliberative monetary valuation (DMV) and the evidence for a new value theory. (PDF) Land Economics 84 no.3 : 469-488. 21. Deliberative Monetary Valuation in Theory. (External link) Paper No.2007-1 Socio-Economics and Environment in Discussion (SEED) Working Papers ISSN1834-5638. Commonwealth Scientific and Industrial Research Organisation (CSIRO), Canberra, Australia, 2007. Published as: Clive L. Spash (2007) Deliberative monetary valuation (DMV): Issues in combining economic and political processes to value environmental change. (PDF) Ecological Economics 63 no.4: 690-699. 20. 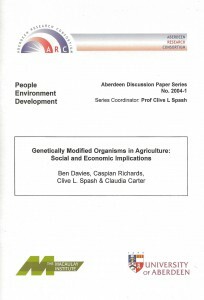 Genetically Modified Organisms in Agriculture: Social and Economic Implications (External link) (with Ben Davies, Caspian Richards, Clive L. Spash and Claudia Carter) Paper No.2004-1, People, Environment, Development, Aberdeen Discussion Paper Series, Macaulay Institute & Aberdeen University, 2004. 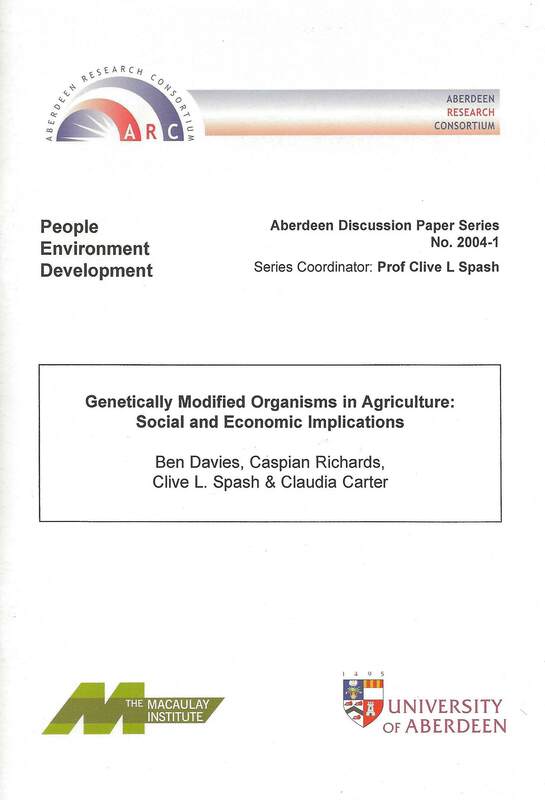 Earlier version published as: Ben Davies and Caspian Richards and Clive L. Spash (2002) The Socio-Economic Implications of Biotechnology in Agriculture: Exploring the Issues. In Proceedings of Genetic Engineering and the Intrinsic Value of Animals and Plants. Royal Botanic Garden, Edinburgh, UK, 18th – 21st September 2002. Edited by David Heaf and Johannes Wirz, pp.62-75. 19. Exploring the Approach of Institutional Economics to the Environment (External link) (with Mauricio G. Villena) Paper No.11, Environment Series, Department of Land Economy, University of Cambridge, 1999. 18. Wildlife Conservation. (External link) (with J. Aldred) Paper No.7, Environment Series, Department of Land Economy, University of Cambridge, 1998. Published as: Clive L. Spash and Jonathan Aldred (1998) Wildlife conservation. In Encyclopaedia of Applied Ethics, Volume 4. San Diego: Academic Press Inc., pp.537-546. 17. Environmental Management Without Environmental Valuation? (External link) Paper No.2, Environment Series, Department of Land Economy, University of Cambridge, 1996. 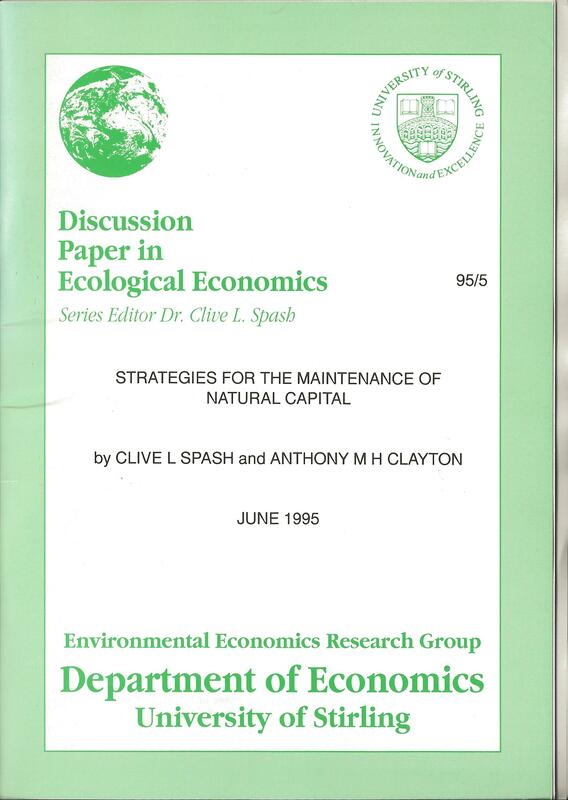 Published as: Clive L. Spash (1997) Environmental management without environmental valuation? In Valuing Nature: Economics, Ethics and Environment. Edited by John Foster. London: Routledge, pp.170-185 Chapter 11. 16. Compensation Payments for the Greenhouse Effect: The Importance of Rights-Based Beliefs, Discussion Papers in Ecological-Economics, Environmental Economics Research Group, University of Stirling, 1995. 15. Strategies for the maintenance of natural capital (External link) (with Anthony Clayton). Discussion Papers in Ecological-Economics, Environmental Economics Research Group, University of Stirling, 1995. 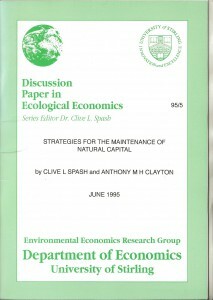 Published as: Clive L. Spash and Anthony M H Clayton (1997) The maintenance of natural capital: Motivations and methods. (PDF) In Andrew Light and Jonathan M. Smith (eds.) Space, Place and Environmental Ethics. Series: Philosophy and Geography vol.1 (Lanham: Rowman & Littlefield Pub. Inc.) pp.143-173. 13. Nitrate Pollution due to Agriculture, Project Report No.3: Should the Polluter Pay? (External link) (with D. Parsissons and N. Hanley). Discussion Papers in Ecological-Economics, Environmental Economics Research Group, University of Stirling, 94/9 July 1994. 12. Nitrate Pollution due to Agriculture, Project Report No.2: Cross Compliance of Agricultural and Environmental Policies (with D. Parsissons and N. Hanley). Discussion Papers in Ecological-Economics, Environmental Economics Research Group, University of Stirling, 94/8 July 1994. 11. Nitrate Pollution due to Agriculture, Project Report No.1: Policy in the United Kingdom (with D. Parsissons and N. Hanley). Discussion Papers in Ecological-Economics, Environmental Economics Research Group, University of Stirling, 94/7 July 1994. 10. Cost-Benefit Analysis of the Greenhouse Effect, (with N. Hanley). Discussion Papers in Ecological-Economics, Environmental Economics Research Group, University of Stirling, 94/6 July 1994. Published as: Nick Hanley and Clive L. Spash (1993) Cost-Benefit Analysis of the Greenhouse Effect. In Nick Hanley and Clive L. Spash Cost-Benefit Analysis and the Environment. Aldershot, England, Edward Elgar Chapter 13. 9. Sources of Energy and the Environment (External link) (with A. Young), Discussion Papers in Ecological-Economics, Environmental Economics Research Group, University of Stirling, 94/3 March 1994. Published as: Clive L. Spash and Andrew Young (1995) Environmental imperatives and renewable sources of energy. In The New Global Oil Market: Understanding Energy Issues in the World Economy. Edited by Siamack Shojai. Westport, CT: Praeger Publishers, pp.159-172 Chapter 15. 8. The Benefits of Preventing Crop Loss due to Tropospheric Ozone, Discussion Papers in Ecological-Economics, Environmental Economics Research Group, University of Stirling, 94/2 March 1994. Published as: Clive L. Spash (1997) Assessing the economic benefits to agriculture from air pollution control. Journal of Economic Surveys 11 no.1: 47-70. 7. Preferences, Information and Biodiversity Preservation: II (External link) (with N. Hanley), Discussion Papers in Ecological-Economics, Environmental Economics Research Group, University of Stirling, 94/1 March 1994. Published as: Clive L. Spash and Nick D. Hanley (1995) Preferences, information and biodiversity preservation (PDF) Ecological Economics 12 no.3 (March): 191-208. 6. Problems in Valuing the Benefits of Biodiversity Preservation (External link) (with N. Hanley and L. Walker). Economics Department, University of Stirling, Discussion Paper 94/3 January 1994. Published as: Nick D. Hanley, Clive L. Spash and Lorna Walker (1995) Problems in valuing the benefits of biodiversity preservation. Environmental and Resource Economics 5: 249-272. 5. Intergenerational Modelling of the Greenhouse Effect, (External link) Economics Department, University of Stirling, Discussion Paper 94/3 January 1994. 4. Preferences, Information and Biodiversity Preservation: I (External link) (with N. Hanley), Economics Department, University of Stirling, Discussion Paper 93/12 July 1993. 3. Future Harm and Current Obligations: The Case of Global Warming, (External link) Economics Department, University of Stirling, Discussion Paper 93/11 July 1993. 2. Protecting Sites of Special Scientific Interest: Intrinsic and Utilitarian Values, (External link) Economics Department, University of Stirling, Discussion Paper (with I.A. Simpson) 92/13 June 1992. Published as: Clive L. Spash and Ian A. Simpson (1994) Utilitarian and rights-based alternatives for protecting sites of special scientific interest. Journal of Agricultural Economics 45 no.1: 15-26. Published as: Clive L. Spash and Ian A. Simpson (1993) Protecting sites of special scientific interest. Journal of Environmental Management 39: 213-227. 1. The Rights and Wrongs of Intergenerational Externalities. (External link) Economics Department, University of Stirling, Discussion Paper 92/4 February 1992. 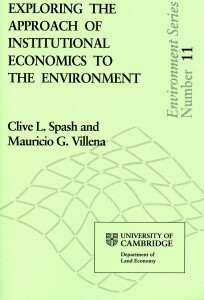 Published as: Clive L. Spash (1993) Economics, ethics, and long-term environmental damages (PDF) Environmental Ethics 15 no.2 (Summer): 117-132.